I’m always looking for new ways to add meaningful interactions to courses and have been exploring Raptivity for this purpose. Raptivity is a rapid development software tool that comes with a library of pre-built templates, most of which are interactive. The pre-built templates provide a way to quickly assemble an interaction or presentation segment and publish it to a Flash (.swf) format. You can use Raptivity to create a stand-alone course or you can import the published file into another tool, like Articulate Presenter or Captivate. I’ve been working with the latter approach and have been pretty happy with the results. The full Raptivity library of around a dozen products provides over 225 presentation and interactive templates for various audience groups. Many interactions are appropriate for adult learners, while others would only be appreciated by children. 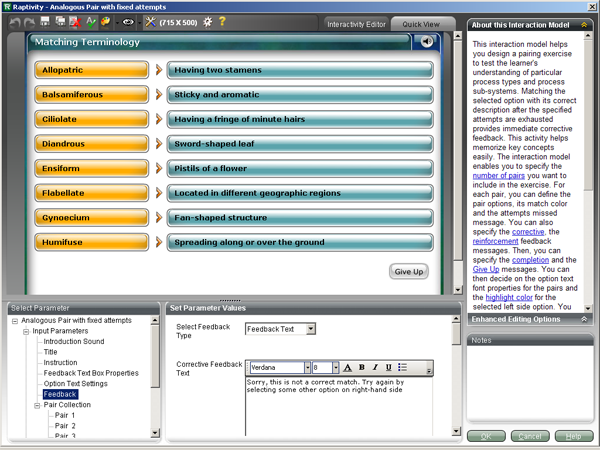 The central product is the Raptivity Essential Pack, which provides a dozen different categories of interaction models, like Brainteasers, Presentation Aids, Interactive Diagrams, Interactive Questions, Software Simulations, Surveys, Glossary, etc. Within each category are several templates. For example, in the Brain Teasers category you’ll find templates for a jigsaw interaction, flash cards, analogous pair, wild cards and a classification exercise. Many of the templates provide users with a quick way to design and build an interaction. A few of the templates, like building a screen of text bullets synchronized with audio, already come in most authoring tools, but are useful if you’re using Raptivity to make stand-alone courses and presentations. Although the templates are quite customizable, they are not completely dynamic and are limited in the number of objects they allow. For example, an interaction might only allow 4 pictures or 8 sets of matching items. One of the things that makes Raptivity unlike any product I’ve ever used is that it provides just-in-time support right in the design template. At first I found it confusing because it crowds the screen, but over time I’ve come to appreciate the assistance. Essentially, the documentation for using the template is on display as you work. It’s a unique approach. 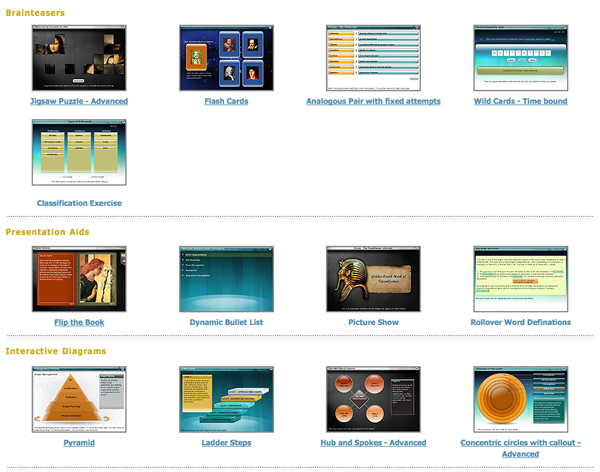 Another unusual feature is that the product is immersed in instructional design models. 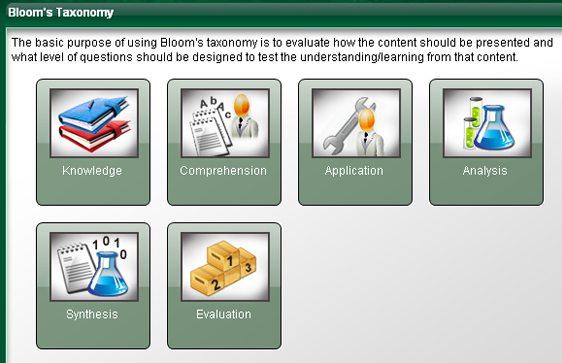 As you browse through the library of templates, you can choose by the category types mentioned earlier, or you can browse by various instructional design paradigms, like Bloom’s Taxonomy, Gagne’s Nine Events, Keller’s ARCS Model and Experimental Learning. See the screen capture below. Even if you’re not familiar with these models or not interested in them, it does point out that someone at Raptivity is thinking about instructional design. I think the intentions were good. In an effort to make everything easily available to the user at one time, they crowded it all in. If Raptivity had a Tabbed Interface, however, users could still have access to the tools and support documentation but the clutter would be gone. In addition, the terminology needs tweaking. As you design, you select parts of the template, like the Title of the interaction, from the “Select Parameter” window. You change the text or number of items in the “Set Parameter Values” window. Huh? This is the kind of talk that makes sense from a programming perspective rather than the user’s perspective. On the positive side, there’s a cool little feature where you can take Notes. Once you become familiar with the interface, it’s quite easy to quickly build new presentation aids and interactions from their templates. And I like the wide range of interaction types. If you go to their Products page and select pre-built interactions, you can view the categories and templates that are in each Pack. Raptivity has a free 14 day trial period, so you can check it out without immediate purchase. Let me know what you think. The Raptivity Essential version sells for $750, with great discounts for education, government and non-profit organizations. If you liked this article, please share it with the tools below. I agree, the UI needs to be decluttered. Tools like Raptivity are nothing but oversimplification of what is called ‘Interactive learning’. I have yet to find anyone who is using Raptivity successfully in their Cap4 files. If there’s someone out there that is having success, I would love to know your secret. I think the product could work well for us, assuming I can get it to work. We’re looking at Raptivity. Who are the competitors? Is Raptivity the only one who does these types of interactions? Is Articulate Engage a good comparison? I have had a look at Raptivity and it would seem to have the largest selection of interactions available by a long shot. I also like the fact that it works with iSpring (which I prefer over Articulate). The only issue is that to get something really slick and corporate looking I imagine needs someone that has a lot of experience using it. Where can I find a Raptivity expert for hire? Do they exist? Are they freelance? Any leads as to my next move greatly appreciated. Hi George – Maybe someone here will see your request. Other ideas are to request help on the LinkedIn eLearning Guild site and the LinkedIn eLearning Professionals site. If you use Twitter I’d put out a request there. You could also contact the people at Harbinger who make Raptivity. Finally, you could advertise the job on the ASTD job board as well as the eLearning Guild’s job board. Hope that gives you some ideas. Good luck! […] http://theelearningcoach.com/reviews/software/raptivity-a-review/. This article is a reference for an Assessment in E-Learning course.